Our domain expertise has enabled us to come up withGalvanized Colour Coated Profile,Galvanized Colour Coated Profile Sheet.These are manufactured by the experts using best quality material procured from trusted vendors of the market. The offered products are manufactured in order to meet the diverse requirements of varied customers. These are widely used for industrial roofing, airport hangers factory sheds, cladding, farm houses and warehouses. Our domain expertise has enabled us to come up with Galvanized Colour Coated Profile,Colour Profile Roofing Sheets. These are manufactured by the experts using best quality material procured from trusted vendors of the market. The offered products are manufactured in order to meet the diverse requirements of varied customers. These are widely used for industrial roofing, airport hangers factory sheds, cladding, farm houses and warehouses. 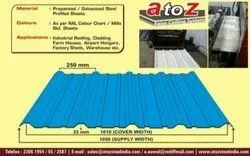 Looking for Colour Coated Roofing Sheet ?